The use of information and communication technologies (ICTs) and mobile devices to assist language acquisition has expanded rapidly during the past decade given the prevalence of broadband networks and mobile phones. Many studies have examined how these technologies can facilitate English-language learning. The chapter will discuss the current research on using ICTs to create e-portfolios to support language learning, the role of mobile devices in the language-learning process, the impact of using ICTs on English-language learners' (ELLs) learning other than language acquisition (e.g., increasing their sense of a learning community), and the design procedure of such a learning environment. Future research in this area also will be discussed. To develop students’ fluency in a second language, instruction needs to focus on improving learners’ vocabulary, grammatical skills, reading and writing skills, and conversational skills. 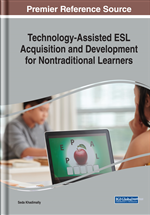 This chapter focuses on adult ELLs (non-native English speakers in higher education) who have limited English proficiency and need to take developmental courses when studying in universities in English-speaking countries. These international students usually have to face challenges such as language proficiency, cultural differences, and learning styles, undergoing an adjustment period at university (Samuelowicz, 2006). After assessing these students’ English proficiency and identifying their learning needs, those who are at risk and need language support are advised to take content-based English for speakers of other languages (ESOL) courses. The goals of these courses usually are designed to improve students’ English speaking, listening, reading, and writing skills to foster their college success in academic performance. Many instructors take the communicative-language teaching approach (Richards & Rodgers, 2001, p. 156) to focus on comprehensive pronunciation. The desired outcome is to develop communicative competence, including language and thoughts (flow and fluency), comprehension, vocabulary, and pronunciation. A typical lesson consists of the instructor reinforcing oral practices during the formal learning session in the classroom, assigning students learning materials (e.g., pronunciation exercises, formal speeches, and group conversations), and providing feedback after assessing students’ oral performances through recordings. The time spent and amount of practice in the formal learning sessions simply are not enough to make noticeable differences in communicative skills (Hsu, Wang & Comac, 2008), especially when teaching a large group of students. The instructor needs to provide individualized feedback to all learners. The current development of ICTs and mobile technology provides a potential solution these instructional needs. By adopting the use of ICTs, we can provide a centralized channel for instructors to give assignments in multimedia formats to engage learners. With the advancement in Internet and mobile technology, learners can record written and/or oral assignments and archive assignments via the e-portfolio approach. The e-portfolio enables instructors to monitor learners’ language-learning progress and provide individualized written and/or oral feedback. Moreover, the instructor has opportunities to develop learners’ informal language learning outside of the classroom setting through ICTs’ social networking features. e-Portfolio: Electronic portfolio (e-portfolio) is a method of using technology to archive learning artifacts identified by learners. It can demonstrate students’ growth over time and allows students to engage in a process of continuous reflection. Audioblog: Audioblog refers to blog posts that embed with audio recordings. Multi-Modal Information: Multi-modal information r efers to information that is presented in multimedia format, such as text, graphs, animation, video, and music. Evernote: Evernote is a cross-platform, multimedia notebook app. Many educators use Evernote to manage instructional materials, such as video clips, audio files, images and hyperlinked resources. Blog: Blog enables fast and easy publishing on the Internet. Blog can chronologically archive posts, and these posts can be compatible with multimedia elements (audio, video, hyperlinks, graphic) and mobile platforms. Blog provides a reciprocal-communication mechanism that enables other users to interact with author. Information and Communication Technology (ICT): ICT refers to technology that can facilitate the communication, dissemination, and production of information.